Florence is not only one of the most beautiful Italian Renaissance cities and the capital of wonderful Tuscany, but also one of the most romantic places in the world to get married. The places where to hold the ceremony itself, whether civil or religious, then they are many and often very suggestive. 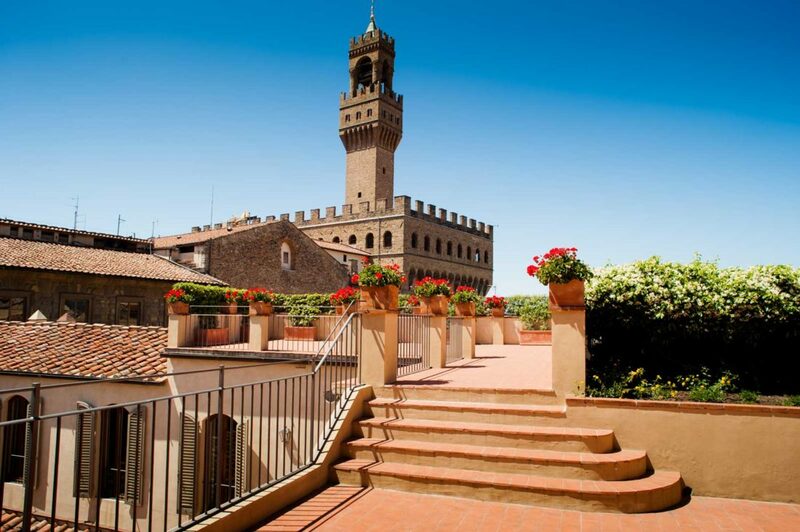 For civil marriages, the place of excellence is certainly Palazzo Vecchio, with its marvelous Sala Rossa dedicated to weddings. Should you wish to be married in a church, Florence has many beautiful Catholic churches for you to choose from – and it is said that the Basilica di San Miniato al Monte, a Romanesque church situated on one of the highest sites in the city, is not only the most beautiful in Florence, but also in the whole of Italy! In the city center is the church and former convent of Santa Maria Maddalena dei Pazzi, which is known for its beautiful art, sculptures and frescoes by many famous artists, including the 500-year-old Pazzi Crucifixion by Pietro Perugino. Standing tall about the city is the Duomo, or cathedral, of Santa Maria del Fiore, a huge Gothic construction with a spectacular Renaissance dome. The cathedral dates from the 13th century, although it is built on the site of a former 7th century church, the remains of which can still be seen in the Duomo’s crypt. With its white, pink and green marble exterior and intricate mosaic floors, the Duomo is a superb sight. There are several Protestant churches in Florence – St Mark’s Church is part of the Church of England in the Diocese in Europe, while St. James is an Episcopalian church – and, incidentally, the church where the rock star, David Bowie, was married. Located just five kilometers from Florence, San Martino a Mariano in Fiesole, is perfect for a more rustic wedding in the Tuscan countryside, with the added bonus of a beautiful view of the city. It is close enough to Florence for you and your guests to stay there and avail yourselves of the many opportunities for sightseeing. There are many striking buildings in and around the town of Fiesole which can be booked for your reception. At BeA Alfresco Wedding we can arrange any kind of ceremony and reception for you, using only the best and reliable suppliers. So, whether you are searching for a Catholic, Protestant or Jewish wedding, or a civil or symbolic service we will be here to guide you and ensure that on your special day everything will flow together to create the wedding of your dreams.